What Would Vandana Shiva Say About This? Nearly 80% of the papayas grown in Hawaii are of the transgenic variety. Yes, that means it is GMO. And to people like Vandana Shiva, those three letters are really bad. Just take a look at what she says about it on Twitter. If you were to take what she says, then I guess you’d have to say that the above papaya with no seeds must have been “raped” by a GMO contamination. Then all of the anti-GMO club members are going to join in and spread that same “fact.” They never bother to research any of their facts about the source of their information and it goes all over the social media like a wildfire. When someone does a bit of research to counter their claims, they find out that papayas do sometimes lack any seeds at times and that if it has a funny shape, it is probably a female fruit, not some mutant terminator papaya. Note that this papaya was grown in Asia where there was no such thing as transgenic papayas to begin with. But of course, the “facts” will spread that this is a GMO mutant and so on. So before you send those emails about your horrid discovery containing misinformation that you are completely unaware of, do some research or be called a fool by someone who catches it. Then again, maybe some people like to be called a fool. Aliens Refuse to Make Crop Circles in GMO Fields. I just received this comment a few days ago from the blog post on GMO Free Kauai: Silencing a Dissident post from another blog. The blog basically outlines how if you speak up against these activists, they will do anything within their social media power to silence you. It’s personal and they’ll do it. The original post has nothing to do with pesticides or spraying and completely ignores the fact that they feel that it is okay to personally attack people who speak out. Yup, that’s how they do it. If you don’t like what is being said, bully them online. Destroy their own personal reputation online for that is the Kauai way. Not. We don’t do that here in Hawaii unless you’re an anti-GMO club member. So apparently, when you see the things that they post as having any evidence of no aloha, they now call you an “antagonist.” Wait? Who is an antagonist now? The last I saw was that these anti-GMO club members seem to think that it is all right pass out fliers with their propaganda around farmers’ markets, support coercive intimidation tactics, accuse others of genocide, baby killers, and so on. From the sound of this comment from an anonymous person “lotsofaloha,” it seems that anything is justified. Whether it be being rude towards others because of his or her perception of what is being done, despite the fact that the data does not support this person’s claim. I find it totally amazing also that I’m accused of “fanning the fires.” So when someone speaks out against this kind of tactics of coercive intimidation, it is considered fanning the fire and finger pointing? Well, if your supporters say nasty stuff and do rude things on the social media, it’s your own commentary that is fanning the fire caught for all to see. You know that saying, think before you talk? It might be a good thing to do before you post something if you don’t want it called out. I am pointing that out square and center because hey, I can’t believe you said that! Local people don’t talk like that to each other! So ironic how these commenters ask for positivity and aloha and hate the name calling when they were the first one to give me a new name. Joni Tokyo Rose. Um, lotsofaloha, can you tell your friends there in the GMO Free Kauai club to stop making up names and wishing that I had babies with birth defects or wish me to drink RoundUp? That’s getting old. If you think that is the aloha way, you obviously don’t know what aloha really is. Jessica Wooley: What are you doing in Maui? Jessica Wooley is the representative for District 48 – Kaneohe, Heeia, Ahuimanu, Kahaluu, Haiku Valley, Mokuoloe. She is also the representative who was one of the introducers of the GMO labeling bill last year that caused a whole bunch of drama and controversy, especially to the growers of transgenic papayas. 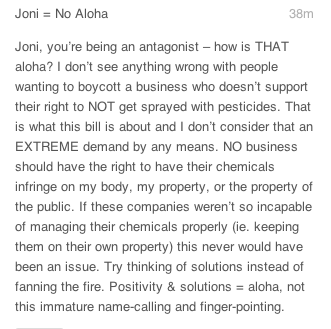 In my opinion, she is one of the key reasons why the GMO issues is growing so heated here in Hawaii. Well, you would think that as a representative of this area, she’d be really looking out for her constituents. Well, if you have papaya farmers in your area, some of whom grown transgenic crops, wouldn’t you want to hear from them how your law would affect them? Apparently not. She’d rather align with the Babes Against Biotech because that’s her interpretation of representing constituents. What?! Why isn’t she listening to people like my dad who has lived in that district and farmed that area for as many years as she has been alive?! Well, as a representative, shouldn’t she be solving problems in her area that affect the residents? One big problem is the flooding that occurs by Waikane stream every time there is a heavy rain, which is pretty often. This flooding issues affects everyone who lives and drives down to the Windward side. With the rainy season upon us soon, you would think that someday someone will do something about it? Um, no. Jessica Wooley is out and about spreading her word for organic farming methods on Maui. Yes, she’s not working hard for her constituents in the Waikane area, but on Maui. She’s talking to farmers there. If you take a look at their board, it is very clear that they are not about coexistence in farming. But alas, we know why Jessica is aligned with these folks. She’s also married to an environmental lawyer, David Henkin, who has engaged in many lawsuits against the state. Earthjustice was the same group who attempted to block the irradiator project which they got moved away from the airport to Kapolei instead. That same irradiator was built to help grow an export industry for Hawaii grown products. Henkin has been not as open because of his wife’s elected position so his fellow Earthjustice attorney Paul Achitoff is at the forefront instead. He is yet another anti-ag supporter too when his videos about Monsanto are used by the anti-GMO groups frequently. It’s quite sad to know that the representative for your Congressional district as well as your own local representative is out to destroy family farms. Many of these farms that have been around for decades and have been good stewards of the lands. The green movement that Jessica Wooley is supporting is not about the supporting local people, its about what Earthjustice wants to do to the ag industry…. Destroy it. Hawaii has succeeded in becoming the first state of the nation to completely ban all GMOs . It comes after a long battle between politicians and their activists and big ag in the state that started back in 2013 with two key bills being passed by county council members. The early roots of the GMO ban started when a moratorium was passed against any research of the taro or kalo. Subsequent efforts were started in thanks to Jessica Wooley and her Bill 174 to label GMOs which eventually failed to pass. However, thanks to the efforts of Gary Hooser and Tim Bynum with Bill 2491 and Margaret Wille and Brenda Ford with Bill 113, subsequent laws continued to follow to suit to limit and eventually restrict biotechnology across of our islands. Tulsi and Mike Gabbard also were successful at the detrimental labeling of GMOs too which helped to lead to more consumer fear and misinformation, despite their promises to the farmers for an educational campaign to support it which never failed to materialize. Meanwhile, during all of this furor of anti-GMO sentiment, our sustainable agriculture industry has been suffering many set backs over the years leading up to the eventual ban. Many local industries have been hit very hard by the lack of tools and technology left for them to remain at the helms of their farms. In a recent survey, the number of farmers had dwindled down to less than .5% of the population and shows no stopping the declining numbers. As a result of these kinds of restrictive laws placed on farmers, imported food has risen to 98% which was an unintended consequence of these laws due to the black marketing campaign of the organic industry and public pressure on politicians. The Kona coffee industry has suffered tremendous losses since the initial introduction of the coffee borer beetle (CBB). It was hopeful that the spraying of Beauvaria Bassiana would control for this beetle. It worked to minimize the millions of dollars worth of damage being done but it was found that the CBB has developed a resistance to the B. bassiana within a 5 year period that was discovered by a farmer after finding more and more of his crops destroyed. The industry has also been hit by the spread of coffee rust around the islands due to the recent increases in hotter weather and drier conditions leading to more plant stress on the coffee trees. The entire coffee industry is at 20% of what it used to be and is mostly being sold as high end niche market products due to the rising costs of production. Unbeknownst to the the local beekeepers on the Big Island, the spraying of B. bassiana had a devastating effect on their bee population. Recognized by the Xerces Society as being highly toxic to bees, the overspray of this organically approved pesticide had residues that affected local bees. The honey production dropped significantly as the lack of biotech research was banned and the already threatened bee population declined even further with the varroa mite and then increased pesticide use. Honey is no longer being produced on the Big Island as a result of the demise of the bees. The papaya industry has been completely obliterated by the passage of Bill 113 and the successful lobbying of Tulsi Gabbard’s labeling law passed at the federal level. Just as Japan was starting the importation of Hawaiian papayas and farmers increased production, the misinformation being spread by the labels caused a tremendous drop in domestic sales across the country. The demand for the fruit dropped to a mere 10% and took a tremendous dive. The lack of education as promised by our Congresswoman failed the industry and Hawaii no longer exports papayas as a result of her labeling effort. Mexico has now become the dominant leader in papaya exports to Hawaii and the mainland US which has had several problems with salmonella contamination and multiple recalls and illnesses. The pineapple industry has also taken a huge hit in production due to the banning of biotechnology as an imported pest from Mexico caused huge crop destruction across the islands. With limited ability to use modern pesticides and biotech advances, the entire Hawaiian pineapple is just one a faint memory of our rich agricultural heritage in the islands. The only fresh pineapples are currently being imported from South America as the state is no longer able to produce these cost effectively. The kalo has also become extinct in our islands also. With the recent introductions of new pests from imported produce from China and Mexico, as well as the recent prolonged dry spells. The taro has suffered multiple set backs despite the efforts of the farmers to mitigate the stresses of disease and pests. The moratorium on the research of taro and resistance to revisit the bill was not removed in time to save the taro from its fate. The Hawaiian staple of poi is no longer available as a result of the lack of tools and acceptance of biotech to help combat the demise. Currently, taro is being imported from China and being researched on how to create a similar substance to that of poi. The once growing demand for locally raised beef was undermined by the efforts of the multiple anti-GMO bills passed in the islands. Ranchers who’s livelihoods were continuously attacked for their use of GM feed have found that they no longer are able to continue their profession, as the the cost of ranching severely impacted their ability to remain financially viable. Local milk production has also ceased operations also and all milk is imported into the state due to the high operating costs resulting for the GMO bills. After initially opening up the UH Cancer Research Center, the ban on GMO inadvertently blocked all research on the latest cancer treatments that were GMO derived. Scientists and researchers’ works were completely halted as the ban covered all of organisms being used in the state. Just as they were on the verge of finding a treatment for breast cancer focusing on genetic modification, the attorney general concluded that such research was considered illegal under the law. The cost of food production rose 30% following the ban due to increased enforcement and regulation on the determination of genetically modified food. 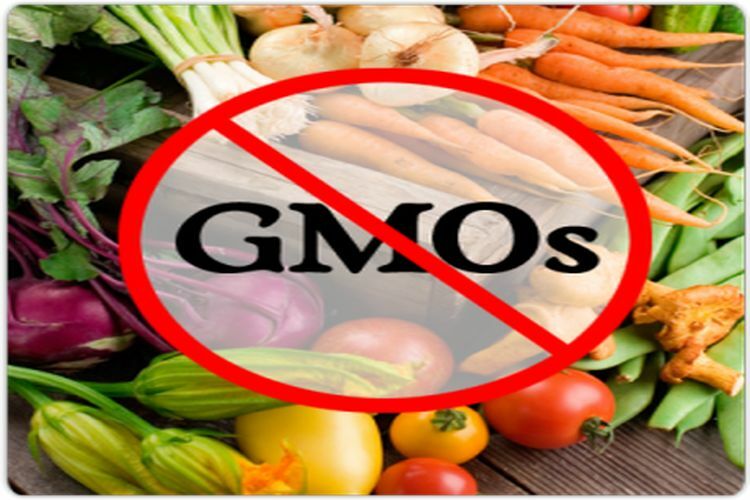 GMO food stuffs had strict requirements and testing was enacted as a result. Testing of the quantities of modified foods were the major reason behind the rise in food costs. In addition to Hawaii already paying higher food costs, the costs are approximately 40% greater than costs on the mainland. Poverty rates in our islands has increased from 17.4% in 2013 to nearly 25 to 30% due to the high costs of living factored in. With the lack of big ag on former cane and pineapple lands, the sustainable organic ag industry supported by small organic farmers has taken a great toll on the capability of the state to manage the current infrastructures. Land leases to these small farmers have had to rise to help cover the costs of maintaining ditches and water tunnels used for the ag areas. Pest management has also become a problem due to the fragmented systems utilized by these small farm plots. Farmers have also had decreased sales as the rising production costs cannot keep up with consumers ability to afford locally grown products. The infrastructures presently in place have significantly deteriorated as a result of the system change resulting from anti-big ag bills being passed. The loss of big ag has also affected a key educational system for the native people in our state. With the lack of reliable tenants on the large stretches of property owned by Bishop Estate, Kamehameha Schools has had to decrease the amount of student aid being provided to existing students and discontinue educational programs being supported by those leases. Bishop Estate has had major losses of revenue on evictions of these small farms that could not pay market prices for ag property. They have also suffered losses for covering the maintenance of the existing infrastructures in place that small farmers are not able to bear the burden of. Many Hawaiians are now on waiting lists to get access to the programs that they were once eligible for. The recent closures of the seed companies on Kauai has had an especially devastating effect on the island. Unemployment has resulted in drug use, property crime, and other crimes have tripled as the companies have transferred operations to foreign countries due to intense regulation. Small organic farmers have tried to use the former seed lands and due to the lack of financial backing have not been able to keep up with rising lease payments to cover infrastructure maintenance. Due to the inconsistent practices of small farmers and a lack of integrated pest management, yields on these farms have been very poor leading to smaller production. Inconsistent soil management practices have also led to severe run off problems from the fragmented farming systems created. Pesticides residues of organically sprayed chemicals have also been found in schools and hospitals at significantly higher levels due to the lack of regulation on these farms. New reports of skin, asthma, and allergic reactions have been increasing as newer studies are finally testing these pesticides against humans. With the loss of agricultural lands, the barren farms have been a developers dream come true as more homes and infrastructure plans are in the works. Due to the isolation of Lanai and potential for power generation, a nuclear power plant is likely going to be built there to power the entire island chains affordably. The increase of homes in Kauai has also led to the building of the next biggest freeway system in Hawaii, H4. The Big Island has also had a huge growth in housing and larger freeway systems are in the plans to be developed. There has been a boom in the construction industry here with the lack of agriculture. One of the biggest and most detrimental effects of the ban of GMOs is the huge brain drain occurring in our islands. As the biotechnology sector grows in both the agricultural and medical sectors, the outlook for students pursuing these careers were bright prior to the ban. The occupational diversity of our state was glowing prior to the politicians’ decisions to ban this growing sector. Currently, the major industry in the islands remain in the tourism sector primarily and the lack of more skilled opportunities have led to yet another brain drain effect. The constant sense of threats and disrespect up until the enacted ban on farmers have cause many farmers to cease participation in farmer’s markets. Many live in fear that they choices that that they have used to farm has put them up as targets by the activists that were first seeking a label then a ban. Many have decided prior to the labeling that the farming business is no longer worth it anymore with the added stressors of the activists. The farmer’s markets have dwindled as the local food supply is dropped dramatically as a result of protesters and activists bullying tactics to farm according to their demands. So although at the time these regulations seemed like “common sense,” the unintended consequences of this strategy has left many current leaders and a growing number of local people asking themselves, “Where did we go wrong?” What was supposed to be the “right” thing at the time, has not created the vision that it was intended to do. It was to create an affordable and sustainable food supply for our state according to what the organic industry was touting as the right way to proceed. How do we get off the wrong path and get back on track and how do we reverse the permanent damage done? If our ag industry continues to be badgered and splintered the way it currently is heading, this unfortunately will be the likely consequences of our present actions. Hawaii can avoid this predicament that is highly likely given the nature of the situation now. Leaders have to think prospectively and consider the evidence presented to make responsible laws, not ones based on “common sense” and public opinion. If you don’t want to face the scenario presented, then we must change our path now before it is too late. The anti-GMO mob is continually stating that anyone who supports biotech should follow the money. Everyone apparently is a paid shill if they are speaking out for the overwhelming scientific evidence. (I sure wish I was paid to do this but I’m not which is hard to believe.) So today’s blog is just doing that, following the money with Gary Hooser. “Lobbyist” means any individual who for pay or other consideration engages in lobbying in excess of five hours in any month of any reporting period described in section 97-3 or spends more than $750 lobbying during any reporting period described in section 97-3. The legally registered lobbyists registered with state include Jeff Mikilina, Alicia Maluafiti, and John Radcliffe. As you can see, even if you give money, the politician does not always listen to it. The latest list filed with the State Ethics commission can be found online with noted names of the seed companies listed also. Note that on Kauai, lobbyists have free range there as the county has not take any steps to regulate it despite being mandated since 1978. What does that say about the transparency issue that Hooser talks about with the seed companies but not within the county itself? Why hasn’t the county tackled this issue first before others if they care so much about the right to know?! Now if these folks are trying to influence legislation, shouldn’t they be subject to the lobbyists laws like the others involved? Take a look at the tax filing that asks if they participated in lobbying activities. Their answer is no. A non-profit cannot be tax free if they are trying to influence or ask others to have an influence on legislation to be in compliance with the law. The IRS has clear rules for what lobbying is. The biotech companies have complied with the lobbying rules and why are the anti-GMO side exempt? I suspect that none of Hawaii SEEDs expenditures have been subject to the taxes that it should be paying for influencing policy and this has been going on for years. Hawaii SEED is not about educating, the video clearly provides evidence that they want to influence laws. Let’s not forget the recent expose’ of the mainland monies being funneled into the who issue at the moment. These very wealthy activists donate money to these non-profits and get a tax write off on that and get to influence policy?! All the meanwhile the companies paying lobbyists to get some say in the legislation get taxed for the same efforts? Where’s the equality and transparency? If a non-profit is getting involved with lawmaking issues, they have to play the game fair and square. The anti-GMO mob complains about the corruption and money, but quickly hide behind bogus non-profits and skid free from the taxes that they should be paying. I do have to question the fact that Andrew Kimbrell, Bill Freese, and Vandana Shiva have come down recently to “educate.” The fact that these people came down to provide consultations as to how to write the bill up which is influencing legislation and contacting lawmakers. That really starts to sound like lobbying to me. However, because it is all under the guise of a non-profit, it is not subject to taxes at the current moment. That needs to change! How about the other activist groups that have been selling items likes shirts and hats? When they sell items and are using it for lobbying purposes like travel for other hearings and meeting with lawmakers, that is taxable. If you search tax ID numbers, there are none for Hawaii GMO Justice Coalition, Babes Against Biotech, or Ohana O Kauai. These groups complain about how corrupt the biotech companies are but are they really doing their fair share? I’ll have a follow up article on this soon. Hooser is all about protecting the people and doing what is right. Is this really right that these groups are allowed to influence the issue with Bill 2491 and not playing by the rules themselves?